The ADAM PROMAP ORTHO System 2 is a precision photogrammetric scanner and orthophoto rectification upgrade kit that can be installed into any ADAM Technology PROMAP. With this kit installed the PROMAP can simultaneously scan and orthorectify images at resolutions of up to 8 microns per pixel with a geometric accuracy of better than 3 microns RMS. Download a brochure now. We are confident that the Promap Ortho System 2 offers a unique 'hybrid' solution for the mapping industry. View our Promap Ortho System comparison to softcopy systems and see for yourself. Improved image capture quality with adjustable settings to maximise output. New on-the-fly colour correction facility which can also be applied to existing scans. Increased Accuracy through the use of improved Geometric Calibration software. Support for overlaying ADAM 3DD 3.1 vector data and sheet files. The ORTHO System 2 is unique in that the scanning and orthophoto rectification is done in a single step. Only the final ortho image is ever stored! There is no need to scan and store all the intermediate image files that a softcopy system would require, nor to scan areas of the image that will not be used in the final orthophoto. 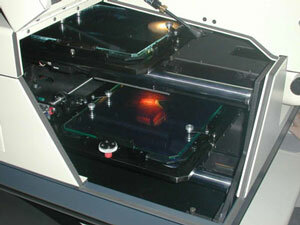 However, if you do need to produce digital images for a softcopy system, the ORTHO System 2 is more than capable. The optical pixel size can easily be set by the user to any value between 8 and 30 microns within minutes, and the software can also resample to any pixel size you require. Improved functionality ensures that the ORTHO System 2 meets the needs of a mapping organisation looking to maximise productivity. The ORTHO System 2 is an Analytical Stereoplotter, Photogrammetric Scanner, and Orthophoto Generator in the one instrument. This combines the best of both worlds -- orthophoto generation and the no-compromise data capturing abilities that only a high-quality analytical stereoplotter can provide. The integration of analytical stereoplotter and orthophoto "machine" ensures that only minimal operator training is required. With the ORTHO System 2 you maintain control over your work-flow and over the quality of your work. On the one instrument you can easily and efficiently produce DTMs from the original diapositives and then scan and create the orthorectified images within minutes, at the pixel size you desire. The ORTHO System 2 also comes complete with a full image editing package that supports all major image formats including TIFF and JPEG, allowing you to use the generated images with any 3rd party products. In addition, the ORTHO System 2 integrates with ADAM 3DD 3.1 allowing you to overlay symbolised vector data generated by 3DD over the top of the scanned ortho image for printing to any Windows-supported printer, including Postscript printers. One of the unique features of the ADAM PROMAP ORTHO System 2 is the fact that the complete orthorectification occurs during scanning. On a softcopy system, entire images are scanned and stored, requiring nearly 2.4GB of storage each at 8 microns, or close to 700MB at a more typical 15 microns. Later, pairs of these images are loaded for observations (DTM generation, for example), and then portions used for the final orthophoto. "Model area" is assumed to be 28% (40% of the width and 70% of the height) of the total area of a 230mm x 230mm diapositive. This would be the normal area of an image scanned for an orthophoto. "Full image" is an entire 230mm x 230mm diapositive, and would typically be used for other purposes. "Pixel Size" refers to both optical pixel size and output pixel size. The software can resample the images to any specified output pixel size. All times include full orthorectification and gamma-correction of the image data and writing of the image data to disk. Pentium III times supplied by a customer and are approximate only. New digital CRI Macro*Color filter with no moving parts. This is an optical filter which is electronically tunable in under 1 ms, with no moving parts or vibration. It switches between the three primary colors to generate the RGB color set. By taking sequential images at each filter setting, a color image is obtained with full color information at each pixel. This triples the image resolution compared to a conventional color CCD camera, where the detector is "painted" or "striped" to record only one of the three colors per pixel. The Macro*Color image registration between color planes is perfect, eliminating color aliasing and improving reproduction of edges. Variable optical pixel size allowing the user to select the optimal balance between speed and resolution (quality) of the job. Image Quality. ADAM Technology recognises the difficulty of maintaining a perfectly clean system in a real production environment. ADAM have therefore designed intelligent dust detection and removal techniques applied during calibration to ensure the images you scan are free from so-called "electronic" dust and other defects. In addition, thanks to the new colour filter and improved illumination system, the ORTHO System 2 also produces higher quality images with a better dynamic range. Breakline support. ORTHO System 2 now supports breaklines. These are lines that triangles are not permitted to cross. They simplify the processing of bridges, dam walls, etc. -- any feature with a radical change in height. Simply digitise a line at the top and at the bottom of the area that you wish to isolate and ORTHO System 2 will take care of the rest. Semi-automatic calibration. The geometric and radiometric calibrations are now largely automatic, to improve both speed and accuracy. The geometric calibration also now uses an intelligent centroiding algorithm to detect the centre of the target very accurately. 3DD Integration. ORTHO System 2 now integrates cleanly with ADAM 3DD 3.1, giving the user two key benefits. Support for 3DD 3.1 sheet files. ORTHO System 2 can be launched directly from the 3DD 3.1 menus to display symbolised sheet data over the top of the Ortho image, ready for printing or storing as Postscript. Support for 3DD vector data. After digitising a DTM, the user can do a quick scan of the model area and then, simply by selecting an option from the 3DD 3.1 menus, overlay the digitised vector data over that image at any time. This assists in checking for job completeness and accuracy checking.